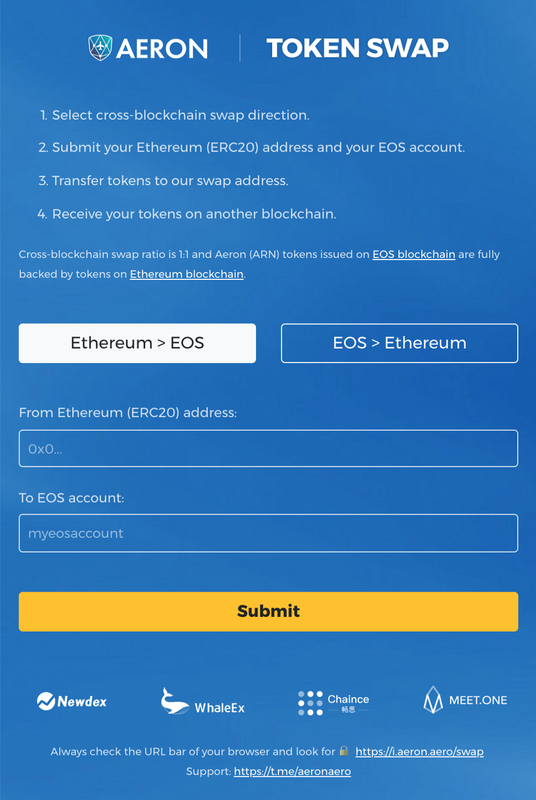 With great pride we announce that Aeron enters EOS ecosystem with the launch of Aeron (ARN) token for EOS blockchain, available with free cross-blockchain token swap. Taking this bold step, the whole new world of EOS decentralized exchanges and liquidity options opens up for ARN token holders, with instant trades in ARN/EOS trading pairs, convenience and innovation promoted by EOS ecosystem. · Both ARN ERC20 and ARN EOS tokens will co-exist. · The swap is not mandatory and can be performed at the holder’s discretion. · There is no time limit for the swap and it will remain open permanently. · An ERC20 token is locked once its EOS counterpart is released (and vice versa), so each EOS token is 1:1 backed by a legacy ERC20 token value. · No any token burning is involved, as the swap is bi-directional and EOS token can be swapped back into ERC20 token at any time. · There is no fee to swap your tokens in any direction.